Some are even (jokingly) calling it TCP/2. I only learned about QUIC a few weeks ago while doing the curl & libcurl episode of the SysCast podcast. The really interesting bit about the QUIC protocol is the move to UDP. Now, the web is built on top of TCP for its reliability as a transmission protocol. To start a TCP connection a 3-way handshake is performed. This means additional round-trips (network packets being sent back and forth) for each starting connection which adds significant delays to any new connection. If on top of that you also need to negotiate TLS, to create a secure, encrypted, https connection, even more network packets have to be sent back and forth. Innovation like TCP Fast Open will improve the situation for TCP, but this isn't widely adopted yet. UDP on the other hand is more of a fire and forget protocol. A message is sent over UDP and it's assumed to arrive at the destination. The benefit is less time spent on the network to validate packets, the downside is that in order to be reliable, something has to be built on top of UDP to confirm packet delivery. That's where Google's QUIC protocol comes in. The QUIC protocol can start a connection and negotiate all the TLS (HTTPs) parameters in 1 or 2 packets (depends on if it's a new server you are connecting to or a known host). This can make a huge difference for the initial connection and start of download for a page. It's absolutely mind boggling what the team developing the QUIC protocol is doing. It wants to combine the speed and possibilities of the UDP protocol with the reliability of the TCP protocol. Wikipedia explains it fairly well. As improving TCP is a long-term goal for Google, QUIC aims to be nearly equivalent to an independent TCP connection, but with much reduced latency and better SPDY-like stream-multiplexing support. If QUIC features prove effective, those features could migrate into a later version of TCP and TLS (which have a notably longer deployment cycle). There's a part of that quote that needs emphasising: if QUIC features prove effective, those features could migrate into a later version of TCP. The TCP protocol is rather highly regulated. Its implementation is inside the Windows and Linux kernel, it's in each phone OS, ... it's pretty much in every low-level device. Improving on the way TCP works is going to be hard, as each of those TCP implementation needs to follow. UDP on the other hand is relatively simple in design. It's faster to implement a new protocol on top of UDP to prove some of the theories Google has about TCP. That way, once they can confirm their theories about network congestion, stream blocking, ... they can begin their efforts to move the good parts of QUIC to the TCP protocol. But altering the TCP stack requires work from the Linux kernel & Windows, intermediary middleboxes, users to update their stack, ... Doing the same thing in UDP is much more difficult for the developers making the protocol but allows them to iterate much faster and implement those theories in months instead of years or decades. Where does QUIC fit in? If you look at the layers which make up a modern HTTPs connection, QUIC replaces the TLS stack and parts of HTTP/2. The QUIC protocol implements its own crypto-layer so does not make use of the existing TLS 1.2. It replaces TCP with UDP and on top of QUIC is a smaller HTTP/2 API used to communicate with remote servers. The reason it's smaller is because the multiplexing and connection management is already handled by QUIC. What's left is an interpretation of the HTTP protocol. With SPDY and HTTP/2 we now have a single TCP connection being used to connect to a server instead of multiple connections for each asset on a page. That one TCP connection can independently request and receive resources. Now that everything depends on that single TCP connection, a downside is introduced: head-of-line blocking. In TCP, packets need to arrive be processed in the correct order. If a packet is lost on its way to/from the server, it needs to be retransmitted. The TCP connection needs to wait (or "block") on that TCP packet before it can continue to parse the other packets, because the order in which TCP packets are processed matters. In QUIC, this is solved by not making use of TCP anymore. UDP is not dependent on the order in which packets are received. While it's still possible for packets to get lost during transit, they will only impact an individual resource (as in: a single CSS/JS file) and not block the entire connection. QUIC is essentially combining the best parts of SPDY and HTTP2 (the multiplexing) on top of a non-blocking transportation protocol. If you're lucky enough to be on a fast internet connection, you can have latencies between you and a remote server between the 10-50ms range. Every packet you send across the network will take that amount of time to be received. For latencies < 50ms, the benefit may not be immediately clear. It's mostly noticeable when you are talking to a server on another continent or via a mobile carrier using Edge, 3G/4G/LTE. To reach a server from Europe in the US, you have to cross the Atlantic ocean. You immediately get a latency penalty of +100ms or higher purely because of the distance that needs to be traveled. 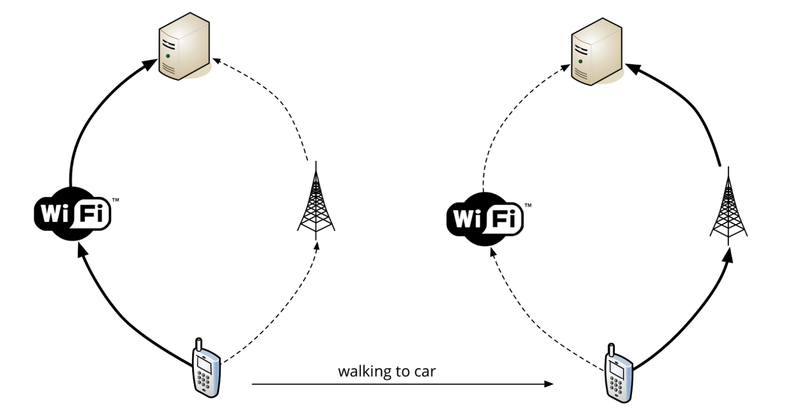 Mobile networks have the same kind of latency: it's not unlikely to have a 100-150ms latency between your mobile phone and a remote server on a slow connection, merely because of the radio frequencies and intermediate networks that have to be traveled. In 4G/LTE situations, a 50ms latency is easier to get. 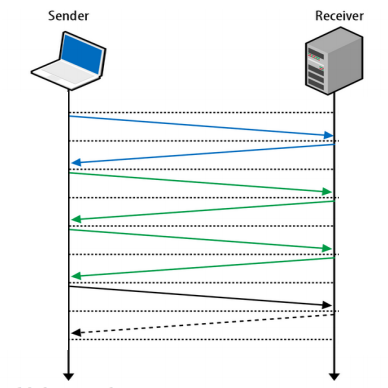 On mobile devices and for large-distance networks, the difference between sending/receiving 4 packets (TCP + TLS) and 1 packet (QUIC) can be up to 300ms of saved time for that initial connection. A nifty feature of QUIC is FEC or Forward Error Correction. Every packet that gets sent also includes enough data of the other packets so that a missing packet can be reconstructed without having to retransmit it. This is essentially RAID 5 on the network level. Because of this, there is a trade-off: each UDP packet contains more payload than is strictly necessary, because it accounts for the potential of missed packets that can more easily be recreated this way. The current ratio seems to be around 10 packets. So for every 10 UDP packets sent, there is enough data to reconstruct a missing packet. A 10% overhead, if you will. 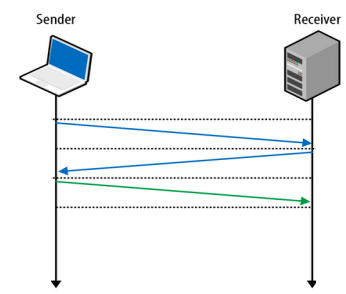 Consider Forward Error Correction as a sacrifice in terms of "data per UDP packet" that can be sent, but the gain is not having to retransmit a lost packet, which would take a lot longer (recipient has to confirm a missing packet, request it again and await the response). Another exciting opportunity with the switch to UDP is the fact that you are no longer dependent on the source IP of the connection. In TCP, you need 4 parameters to make up a connection. The so-called quadruplets. To start a new TCP connection, you need a source IP, source port, destination IP and destination port. On a Linux server, you can see those quadruplets using netstat. If any of the parameters (source IP/port or destination IP/port) change, a new TCP connection needs to be made. This is why keeping a stable connection on a mobile device is so hard, because you may be constantly switching between WiFi and 3G/LTE. With QUIC, since it's now using UDP, there are no quadruplets. QUIC has implemented its own identifier for unique connections called the Connection UUID. It's possible to go from WiFi to LTE and still keep your Connection UUID, so no need to renegotiate the connection or TLS. Your previous connection is still valid. This works the same way as the Mosh Shell, keeping SSH connections alive over UDP for a better roaming & mobile experience. This also opens the doors to using multiple sources to fetch content. If the Connection UUID can be shared over a WiFi and cellular connection, it's in theory possible to use both media to download content. You're effectively streaming or downloading content in parallel, using every available interface you have. While still theoretical, UDP allows for such innovation. The Chrome browser has had (experimental) support for QUIC since 2014. If you want test QUIC, you can enable the protocol in Chrome. Practically, you can only test the QUIC protocol against Google services. The biggest benefit Google has is the combination of owning both the browser and the server marketshare. By enabling QUIC on both the client (Chrome) and the server (Google services like YouTube, Google.com), they can run large-scale tests of new protocols in production. There's a convenient Chrome plugin that can show the HTTP/2 and QUIC protocol as an icon in your browser: HTTP/2 and SPDY indicator. You can see how QUIC is being used by opening the chrome://net-internals/#quic tab right now (you'll also notice the Connection UUID mentioned earlier). If you're interested in the low-level details, you can even see all the live connections and get individual per-packet captures: chrome://net-internals/#events&q=type:QUIC_SESSION%20is:active. Similar to how you can see the internals of a SDPY or HTTP/2 connection. Won't someone think of the firewall? If you're a sysadmin or network engineer, you probably gave a little shrug at the beginning when I mentioned QUIC being UDP instead of TCP. You've probably got a good reason for that, too. For instance, when we at Nucleus Hosting configure a firewall for a webserver, those firewall rules look like these. Take special note of the protocol column: TCP. Our firewall isn't very different from the one deployed by thousands of other sysadmins. At this time, there's no reason for a webserver to allow anything other than 80/TCP or 443/TCP. TCP only. No UDP. For servers, this means opening incoming 443/UDP to the webserver. For clients, it means allowing outgoing 443/UDP to the internet. In large enterprises, I can see this be an issue. Getting it past security to allow UDP on a normally TCP-only port sounds fishy. I would've actually thought this to be a major problem in terms of connectivity, but as Google has done the experiments -- this turns out to not be the case. Since QUIC is only supported on Google Services now, the server-side firewalling is probably OK. These numbers are client-side only: they show how many clients are allowed to do UDP over port 443. QUIC can be disabled in Chrome for compliance reasons. I bet there are a lot of enterprises that have disabled QUIC so those connections aren't even attempted. Since QUIC is also TLS-enabled, we only need to worry about UDP on port 443. UDP on port 80 isn't very likely to happen soon. The advantage of doing things encrypted-only is that Deep Packet Inspection middleware (aka: intrusion prevention systems) can't decrypt the TLS traffic and modify the protocol, they see binary data over the fire and will -- hopefully -- just let it go through. To help debug QUIC I hope curl will implement it soon, there certainly is interest. In a 2015 blogpost Google has shared several results from the QUIC implementation. 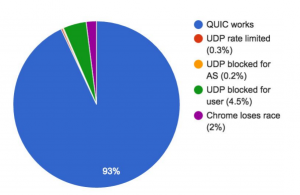 As a result, QUIC outshines TCP under poor network conditions, shaving a full second off the Google Search page load time for the slowest 1% of connections. These benefits are even more apparent for video services like YouTube. Users report 30% fewer rebuffers when watching videos over QUIC. The YouTube statistics are especially interesting. If these kinds of improvements are possible, we'll see a quick adoption in video streaming services like Vimeo or "adult streaming services". I find the QUIC protocol to be truly fascinating! The amount of work that has gone into it, the fact that it's already running for the biggest websites available and that it's working blow my mind. I can't wait see the QUIC spec become final and implemented in other browsers and webservers! Jim Roskind was kind enough to leave a comment on this blog (see below) that deserves emphasising. Having spent years on the research, design and deployment of QUIC, I can add some insight. Your comment about UDP ports being blocked was exactly my conjecture when we were experimenting with QUIC’s (UDP) viability (before spending time on the detailed design and architecture). My conjecture was that the reason we could only get 93% reachability was because enterprise customers were commonly blocking UDP (perchance other than what was needed for DNS). If you recall that historically, enterprise customers routinely blocked TCP port 80 "to prevent employees from wasting their time surfing," then you know that overly conservative security does happen (and usability drives changes!). As it becomes commonly known that allowing UDP:443 to egress will provide better user experience (i.e., employees can get their job done faster, and with less wasted bandwidth), then I expect that usability will once again trump security ... and the UDP:443 port will be open in most enterprise scenarios. ... also ... your headline using the words “TCP/2” may well IMO be on target. I expect that the rate of evolution of QUIC congestion avoidance will allow QUIC to track the advances (new hardware deployment? new cell tower protocols? etc.) of the internet much faster than TCP. As a result, I expect QUIC to largely displace TCP, even as QUIC provides any/all technology suggestions for incorporation into TCP. TCP is routinely implemented in the kernel, which makes evolutionary steps take 5-15 years (including market penetration!… not to mention battles with middle-boxes), while QUIC can evolve in the course of weeks or months. Thanks Jim for the feedback, it's amazing to see the original author of the QUIC protocol respond! Many thanks to Google for leading the efforts here! I’m pretty sure most enterprises never heard of QUIC yet. Hey thanks for this interesting explanation of the protocol. Is there any insight yet on if/when other clients will support QUIC, such as Opera, Firefox, Edge, other Blink implementations? And what about Apache and nginx on the server-side? Also, is there a plan on when/if QUIC will be standardized by e.g. the IETF or so? – This may be, just like in the case of HTTP/2, the perfect time for “smaller” webservers to gain market share by beating the big players to the implementation. I like what Caddy is doing by leading the way, I hope many others follow! In TCP, packets need to arrive in the correct order. I have a simple question : what about SCP “Session Control Protocol” ? QUIC isn’t it redundant with SCP ? With UDP amplification DDoS attacks becoming more popular everyday, how does QUIC prevent a fake request with a spoofed IP address from being answered? Someone mentioned on Reddit that Google Maps gets much faster when you turn off QUIC. I decided to try it, because I’ve actually noticed sometimes Maps hangs and was sometimes slow. OMG! What a difference! Everything is noticeably snappier. I’ll just repeat a comment I made on Reddit: How did Google screw this up so badly? I’m in Southern California on a 100mb connection, so I should never be having issues with communicating with Google, but QUIC is *clearly* not ready for prime-time and Google should not be pushing this out. It has serious problems in the real world. I’m just one anecdotal case, but it sure seems like QUIC has some problems. The order in which they arrive is irrelevant, but they can only be processed in sequence number order. So, if a packet is missing, the processing of all subsequent packets will be delayed until the missing packet is successfully received and processed. TCP packets must be READ in the correct order by the application,, but do not need to be RECEIVED in the correct order. If a packet is lost, you can not read any further than the lost packet because of this ordering constraint, thus causing the head of line blocking mentioned. It sounds like with quic each connection will have separate channels, and each can be recovered independently thus solving this issue. If by now they haven’t, I’d have to seriously question their future viability. “With QUIC, since it’s now using UDP, there are no quadruplets.” is confusing as written since UDP uses the same source and destination address and port metadata as TCP. The difference, as the next paragraph explains, is that there’s no standard session protocol on top of that and the QUIC authors were free to build something different. Having spent years on the research, design and deployment of QUIC, I can add some insight. Your comment about UDP ports being blocked was exactly my conjecture when we were experimenting with QUIC’s (UDP) viability (before spending time on the detailed design and architecture). My conjecture was that the reason we could only get 93% reachability was because enterprise customers were commonly blocking UDP (perchance other than what was needed for DNS). If you recall that historically, enterprise customers routinely blocked TCP port 80 “to prevent employees from wasting their time surfing,” then you know that overly conservative security does happen (and usability drives changes!). As it becomes commonly known that allowing UDP:443 to egress will provide better user experience (i.e., employees can get their job done faster, and with less wasted bandwidth), then I expect that usability will once again trump security… and the UDP:443 port will be open in most enterprise scenarios. …also… your headline using the words “TCP/2” may well IMO be on target. I expect that the rate of evolution of QUIC congestion avoidance will allow QUIC to track the advances (new hardware deployment? new cell tower protocols? etc.) of the internet much faster than TCP. As a result, I expect QUIC to largely displace TCP, even as QUIC provides any/all technology suggestions for incorporation into TCP. TCP is routinely implemented in the kernel, which makes evolutionary steps take 5-15 years (including market penetration!… not to mention battles with middle-boxes), while QUIC can evolve in the course of weeks or months. p.s., It is always nice for write-ups to include a link to the document I published about the “Design and Rationale of QUIC.” Though I’m not updating it these days, it provides a lot of underlying thought that supports the many elements of QUIC. The more recent IETF QUIC draft (a.k.a., Google’s QUIC Wire Spec) was derived from that QUIC design document, and offers far less justification and motivation for decisions. For instance, that design document addresses the DDOS Amplification Attack problem that was raised by a reader… and many other things ;-). Thanks for leaving a response, it’s great to see the original creator still remain so involved! I hope you don’t mind, but I added your comment directly in the post for emphasis – I feel it’s of great value to the readers. I also added additional links to the design documents you mentioned, thanks for the tip. Why not use multiple TCP connections, one for each resource? instead of creating a new protocol. Session resumption seems like a nice idea, but when do you actually need it? On the LAN/broadband, your IP doesn’t change. On mobile, I never download large files using my mobile phone/tablet (due to dataplan and slowness). With TCP the next XHR will reconnect using the new roaming IP address. So all in all, session resumption is a gadget feature. At the end of the day, QUIC seems to improve only for very slow/congested connection, which I believe is a very small amount in developed countries. In these countries where QUIC isn’t useful at all, isn’t it better to improve the existing architecture: the server (use a fast 10k like nginx instead of Apache for example, use gzip…), use efficient caching (there was a good conference by Tim Perry at Voxxed Days (last Feb) on caching BBC Newsbeat) and more importantly optimize the website load time? It seems useful only for streaming on slow brandwidth… quite a limited use really. Maybe it’d just be more simple and efficient to categorize resources (static=fast / dynamic=slow) and have a TCP connection per slow resource and one for all the fast resources. What about the SCTP? What’s wrong with it? It’s widely used in telecom area. Was DTLS ever considered? (TLS over unreliable datagram services like UDP). Or is QUIC built on top of that? Misspelled “even” in “those connections aren’t event attempted”. How about just saying “I find the QUIC protocol to be fascinating!”, and stick with that instead of looking like you are lining up for this ironic distancing, by being unclear about what you say. That’s up for interpretation, but I meant what I wrote in that sentence (without BS or sarcasme): I do find the QUIC protocol fascinating. Long time ago, we used UDP protocols for file transfers…. Since this is a “proven fact” given the current tests, we may see a faster adoption of QUIC than the delivery of HTTP/2 has been. Tiny correction, UUID is not the same as UID. Aside from that, I think this is one of the best introductions I’ve seen to QUIC and answered a bunch of my questions. Sounds like a major innovation. Reminded me of The IT Crowd, https://www.youtube.com/watch?v=H3HFOlYba-4. The error correction is quite impressive, I wonder if there’s more details of how it works. Sorry to have to report that this “feature” is apparently causing sluggish responses on my home W10 computers. I am getting “Failed to load resource: net::ERR_QUIC_PROTOCOL_ERROR” in developers console for gmail and google maps. By disabling this feature in chrome://flags/#enable-quic my response times drastically improve and I no longer see the errors. Version 54.0.2840.87 m (64-bit). I am not seeing this behavior on a centos7 vm running Version 56.0.2906.0 dev (64-bit). I would like to know how Google finds out about these issues and how a casual user would be able to find out why his email and maps are sluggish. I initially thought my internet provider was the problem. Related UDP history, we ran 6 bit Airline Link Control over UDP in the 80’s to provide 1.5 second domestic response times across 1200 bps connections serving 45 terminals or printers. Bob I don’t think you’ve read the article properly. The benefits are huge and can solve a lot of issues we are facing today. TCP is latency and packet loss sensitive. UDP is not sensitive to latency and packet loss has limited impact. Aspera is one of such applications that works over UDP and works very well. 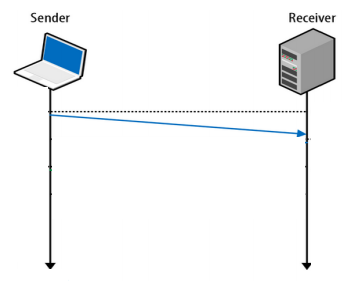 Example: Remote site A has a shared link of 1Gb towards Remote site B. The latency between the sites is 300ms. TCP will give you around 490Mbps max while UDP can saturate the link. For a transfer of a 1GB file it will take TCP around 18sec and UDP around 8.5sec. If you add packet loss of 1% you need to wait 5 hours for the 1Gb file to transfer over TCP. Great explanation fellow inhabitant of Belgium :). There is a small typo just above the figure of QUIC Deployment Experience @Google. You wrote “I would’ve actually though” and forgot the letter “t” at the end of “thought”. You might be interested in the RAET (Reliable Asynchronous Event Transport) protocol. RAET is a Reliable Secure UDP based protocol designed to support distributed applications and reactive data flow systems. It is not limited to replacing HTTP/TCP. Two production systems now use RAET. What about UDP reflection attacks? I read through your article but I didn’t see any mention of it. The recent DYN DDOS attack was made possible because of UDP reflection. Compromised host A pretends to be host B and sends a request to host C (only in UDP can you fake the sender). Now enrol a botnet to all pretend to be the same host B where host B is your attack target and it’s one of the easiest attacks to deliver. I certainly see tremendous value in QUIC and from a defensive security perspective I would probably elect to listen on UDP only if I had an auto-shutdown facility at UDP inbound attack detection. UDP packets can not (to my knowledge) be shaped. This will become a big issue when everyone is starts doing this. So, please don’t. You can use the four tuple to track and shape although in-accurate it’s pragmatic. TCP has window-sizes which allow senders to burst connections awaiting recipient ACKs which can be aggregated into a single cumulative response (although you might not want too considering loss). Could the same be achieved tweaking TCP slow-start and raising the maximum window exponent? And how does it compare to TCP-FASTOPEN that allows connection recycling instead of traditional three packet handshakes with bonus of being able to PUSH data immediately into your first packet. How is congestion control done with QUIC? Google’s version of QUIC (often called gQUIC) does roll it’s own crypto but that is currently being standardised by IETF (commonly known as iQUIC for now) which basically uses TLSv1.3. Eventually iQUIC will replace gQUIC just like HTTP/2 replaces SPDY. What about the equivalent of TCP congestion control? Without that, you can expect weird behavior all around including, but not limited to, congested pipes. TCP Congestion Control is one of the main reasons that pipes are optimally shared amongst competing clients. Two years ago I was doing some packet capture on my computer and spotted this QUIC protocol running for google services on UDP port. Initially I was so confuse because I never seen HTTP traffic on a UDP port and never thought or heard if this is even possible. Then, a quick google search after ‘QUIC’ term, revealed a google document regarding this protocol, but no other further info. I think that was the beginning of QUIC implementation done by google. At the time of the finding I even wrote a small facebook post on my personal page where I stated about my new protocol discovery! Nobody knew at that time what the hell I was talking about! I’m glad that more and more info can be found now about this new protocol and some of the web servers developers are starting to integrate QUIC. Hope, that soon will be integrated into Apache or Nginx, because the client doesn’t seem a problem right now, since most of us use chrome browser by default. Can you show the QUIC packet format Fields?